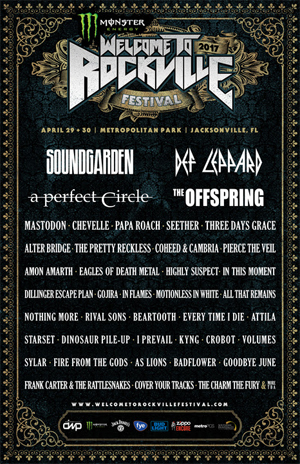 The initial band lineup has been announced for Monster Energy Welcome To Rockville, Saturday, April 29 and Sunday, April 30, 2017 at Jacksonville, Florida's scenic Metropolitan Park along the St. Johns River. Rock legends SOUNDGARDEN (Saturday headliner), DEF LEPPARD (Sunday headliner), and A PERFECT CIRCLE lead the music lineup for Florida’s biggest rock experience, which features over 40 bands on three stages, including a tremendous list of talent with THE OFFSPRING, MASTODON, CHEVELLE, SEETHER, PAPA ROACH and many more. Check out the official Monster Energy Welcome To Rockville video announcement below. "Welcome To Rockville has grown from a single day event into Florida's biggest rock festival experience of the year. The 2017 lineup is a celebration of all things rock, with legends like SOUNDGARDEN, DEF LEPPARD, A PERFECT CIRCLE and THE OFFSPRING balanced with the best of what's current and hot in rock and metal culture. This is a greatest hits celebration for all ages," says founder and producer Danny Wimmer of Danny Wimmer Presents.